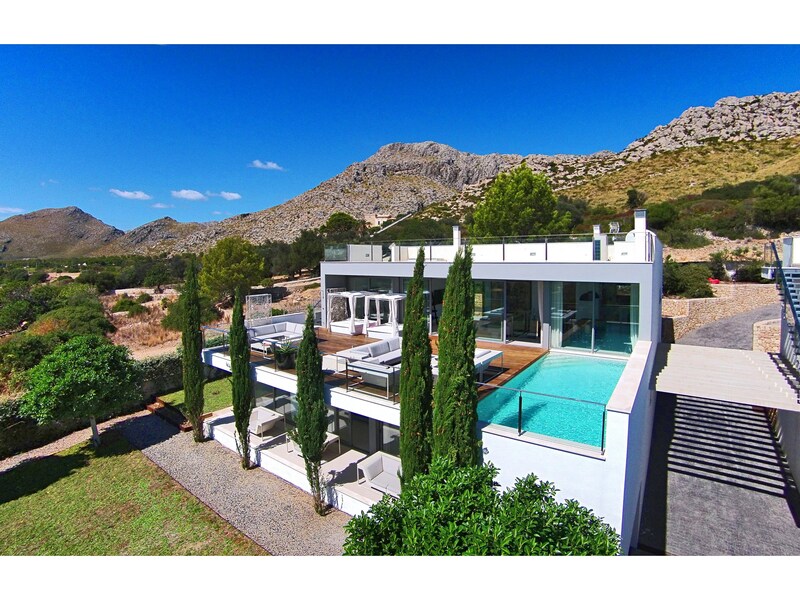 6 Bedroom, 3 Bathroom Villa with Mountain View and a Private Gated Swimming Pool , Air Conditioning, WiFi, tennis Court, Satellite TV, near Golf, Sleeps a maximum of 11 people. 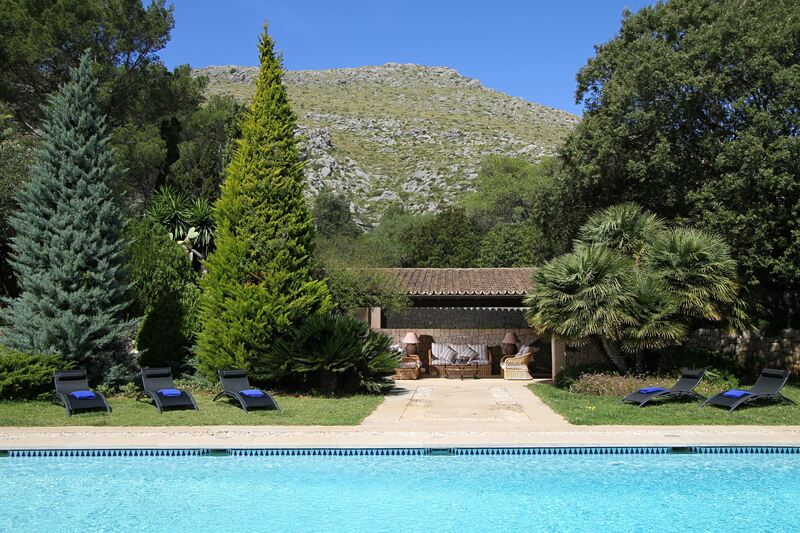 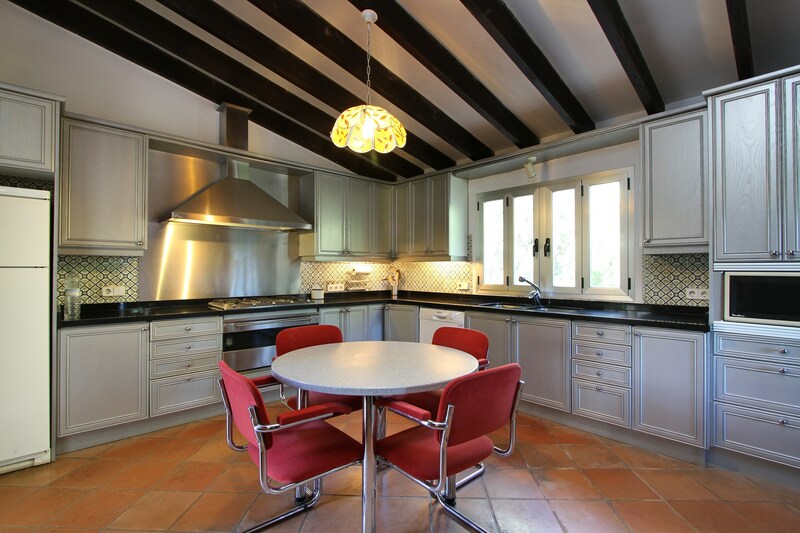 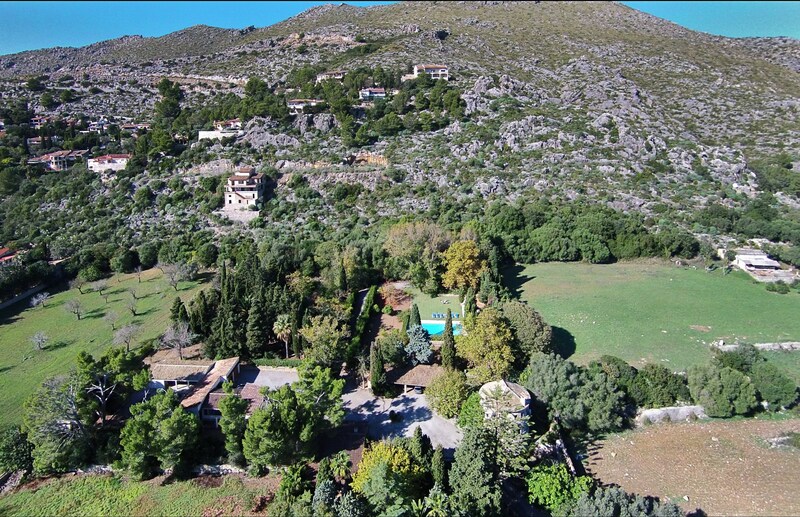 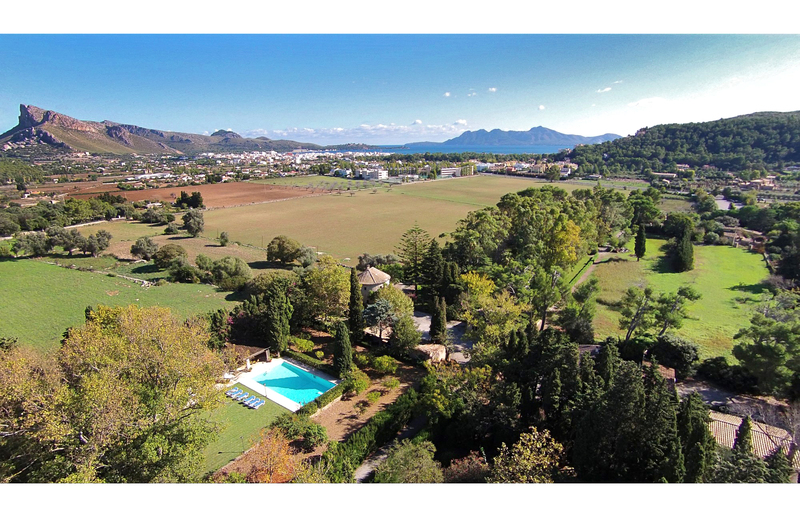 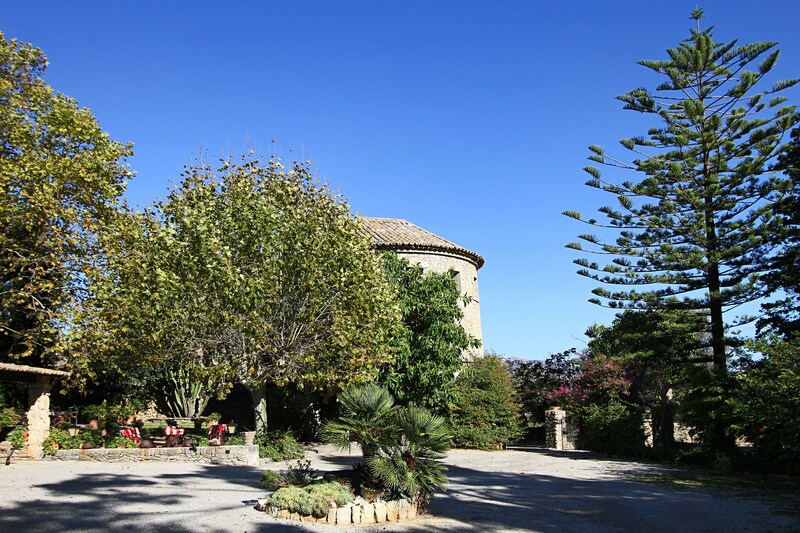 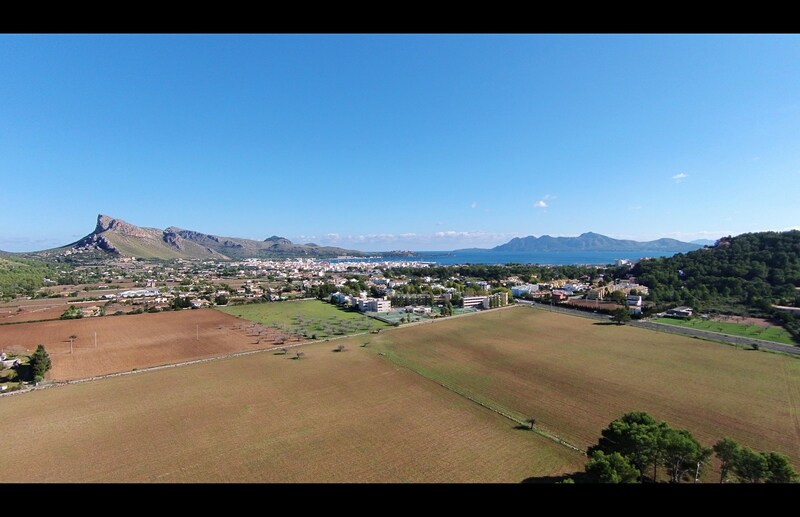 El Bikoro is a wonderful secluded estate consisting of three separate traditional properties nestling in the lovely countryside near Puerto Pollensa in northern Mallorca. 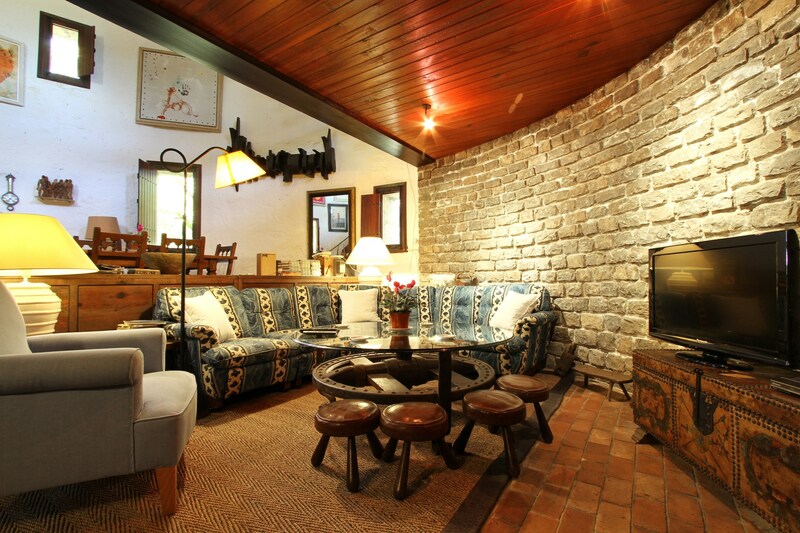 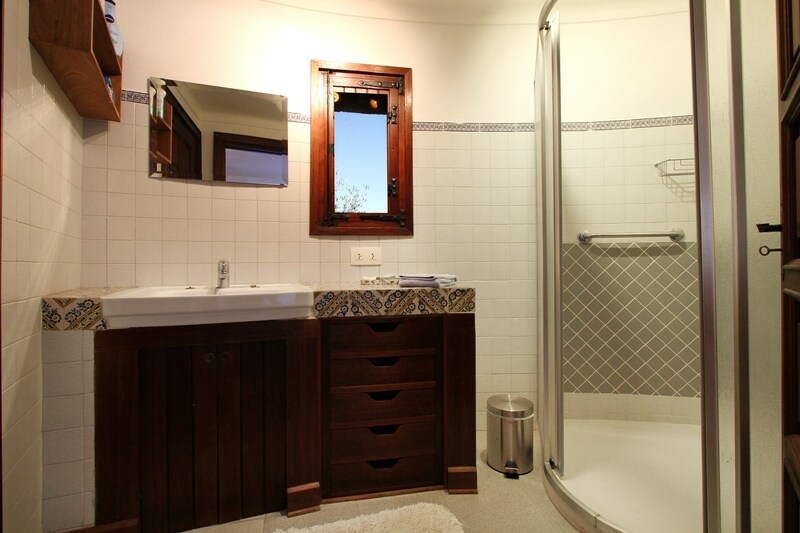 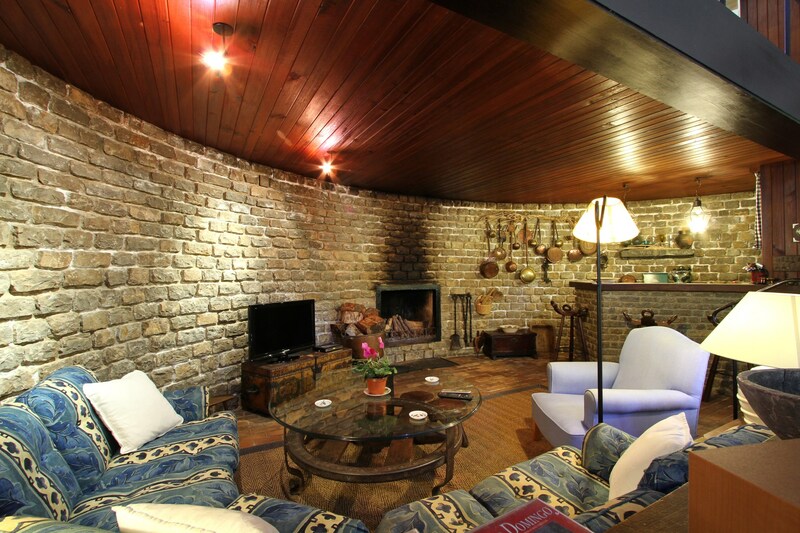 A total of up to 11 guests can be accommodated here in comfort and style. 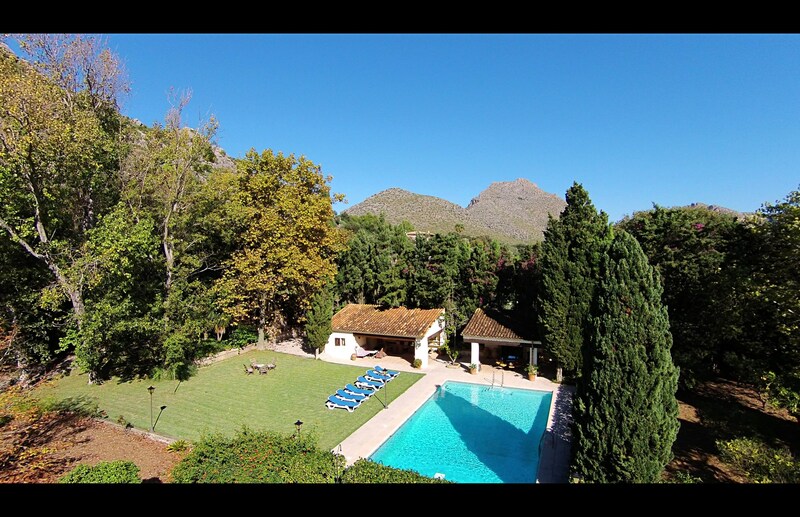 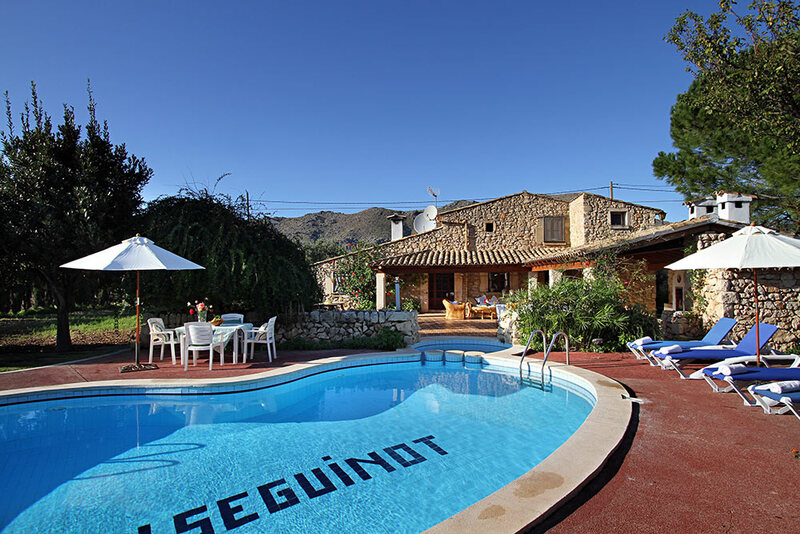 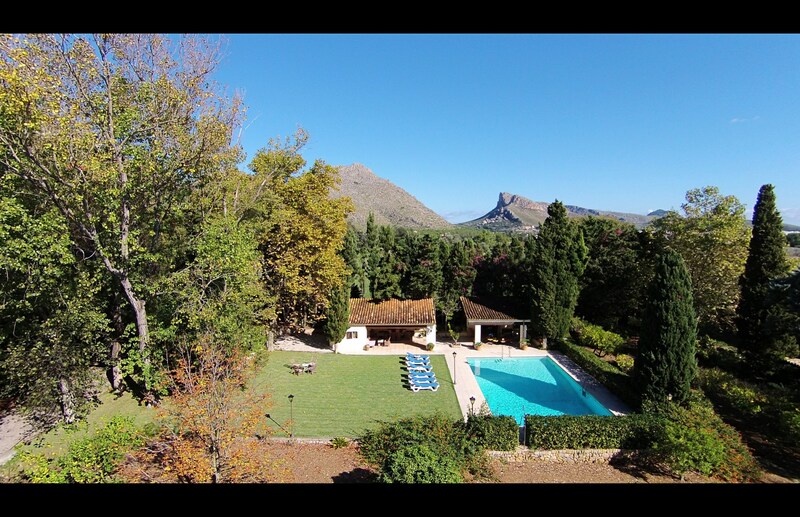 The views over the famous Tramuntana mountains from El Bikoro are absolutely breathtaking, and you enjoy your own private swimming pool and tennis court. 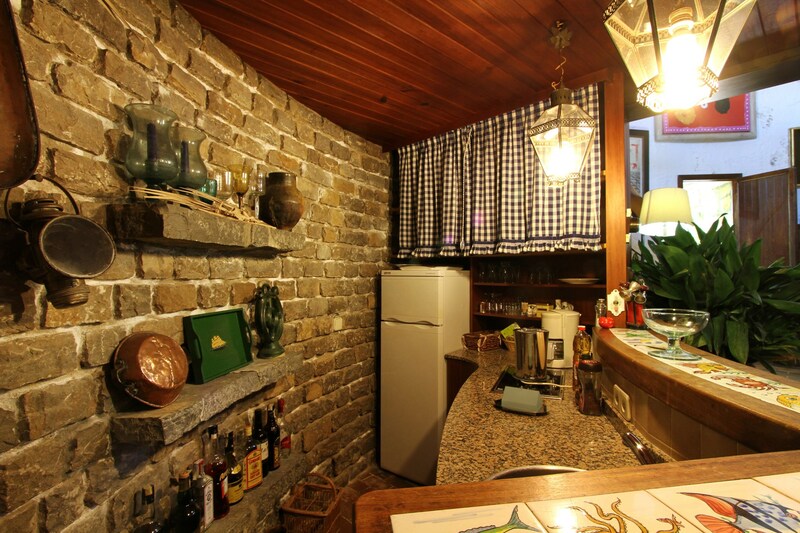 El Bikoro really does offer you an authentic taste of the ‘Real Spain’. 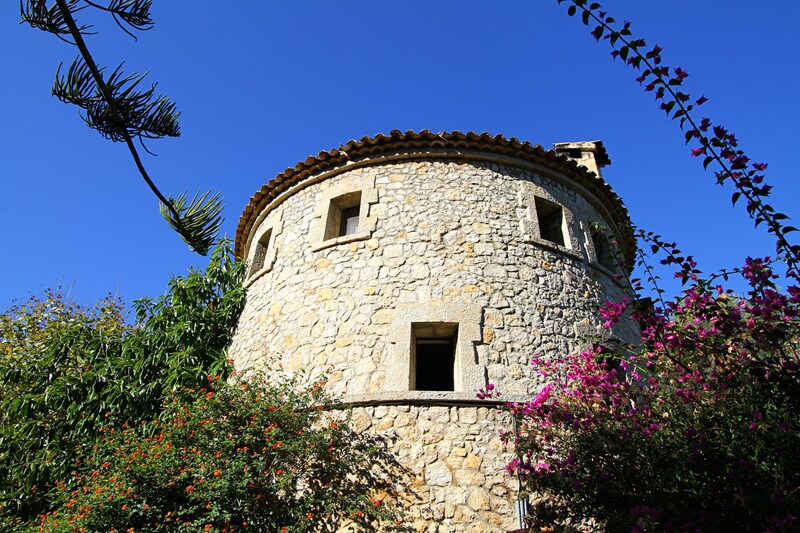 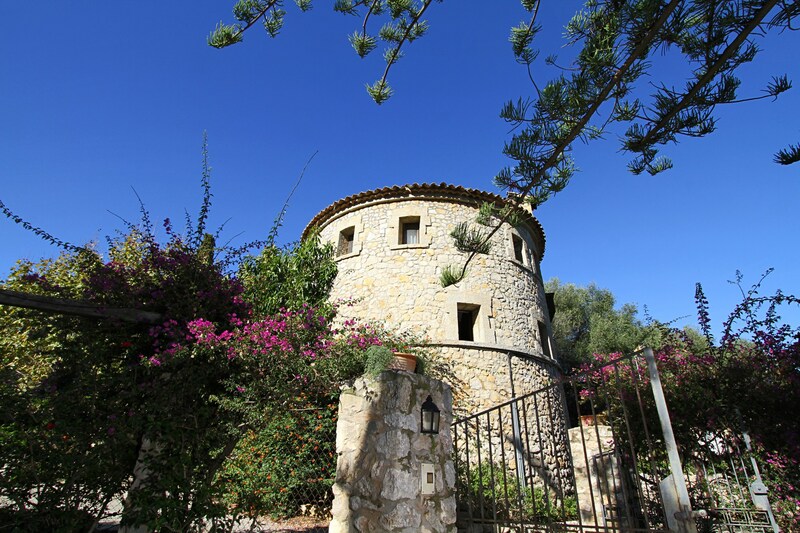 The most magical of it`s buildings has to be the ancient circular stone tower. 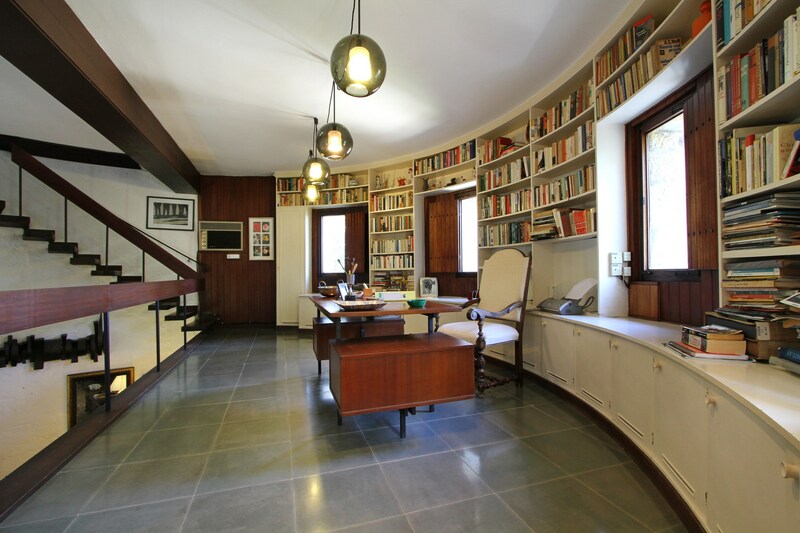 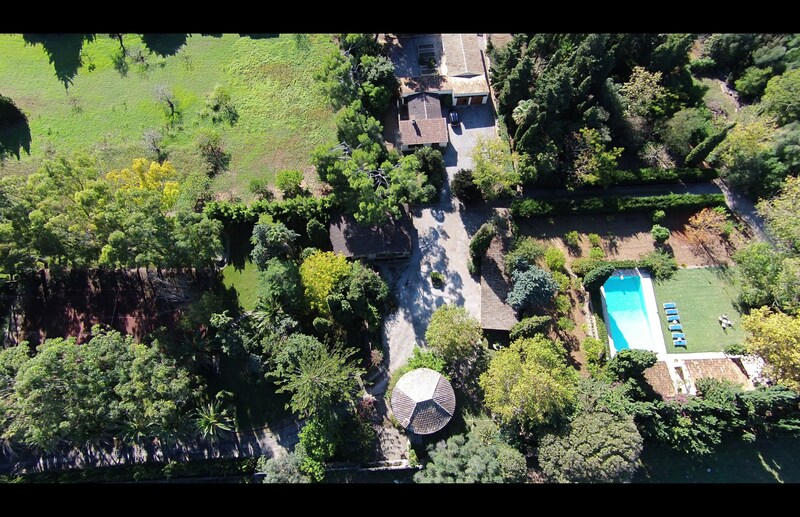 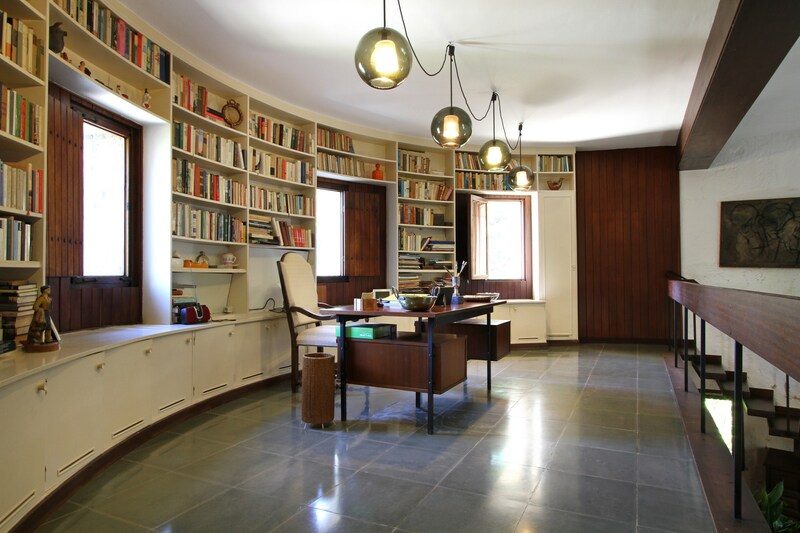 This spectacular edifice has been transformed into a large, villa-like property with 2 double bedrooms, a bathroom, an office/living room, and a kitchenette. 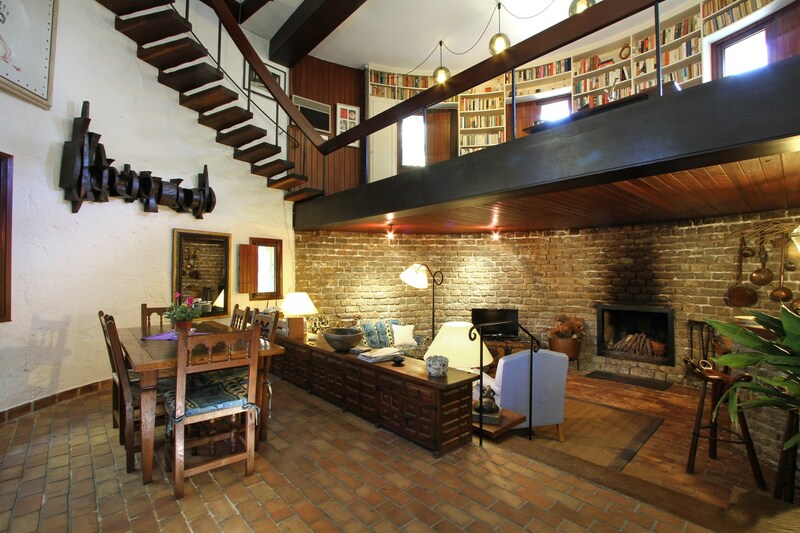 The large tower itself is divided into three levels, all connected by staircases, and all featuring lovely solid wood antique furniture. 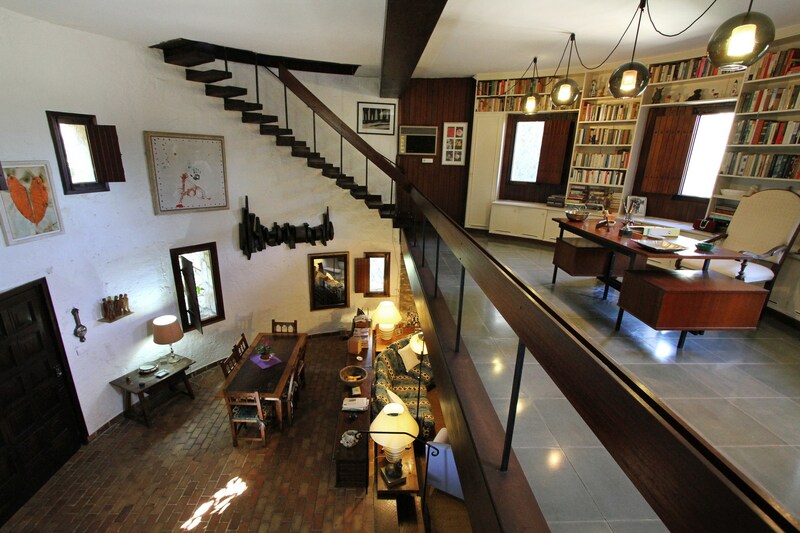 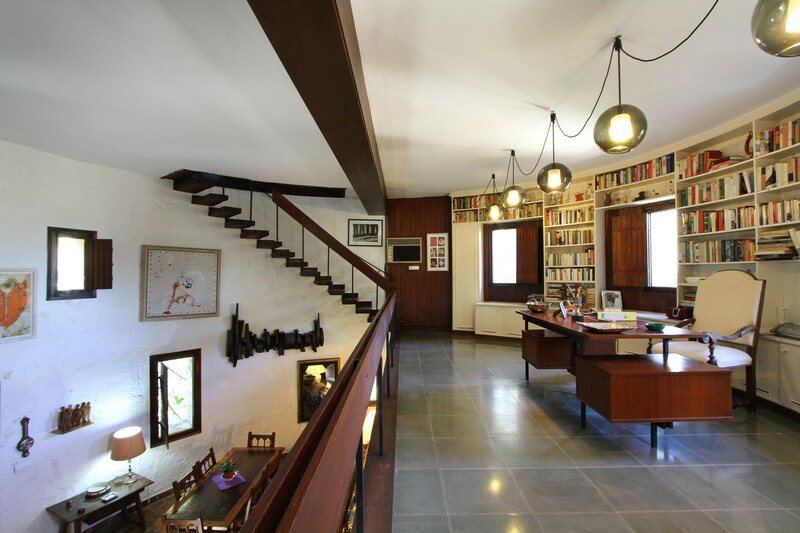 The main living area is overlooked from the floor above, where pride of place is an open interior balcony featuring an extensive library. 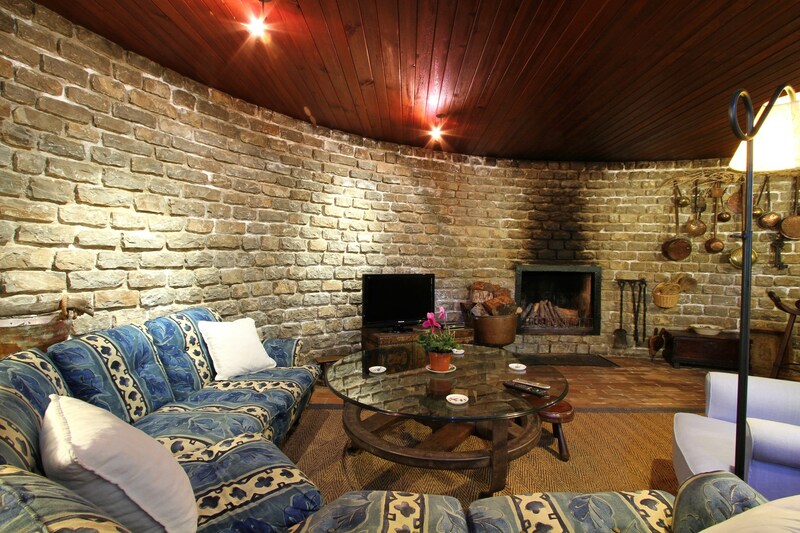 How many people can say they’ve stayed in such a unique, historic property? 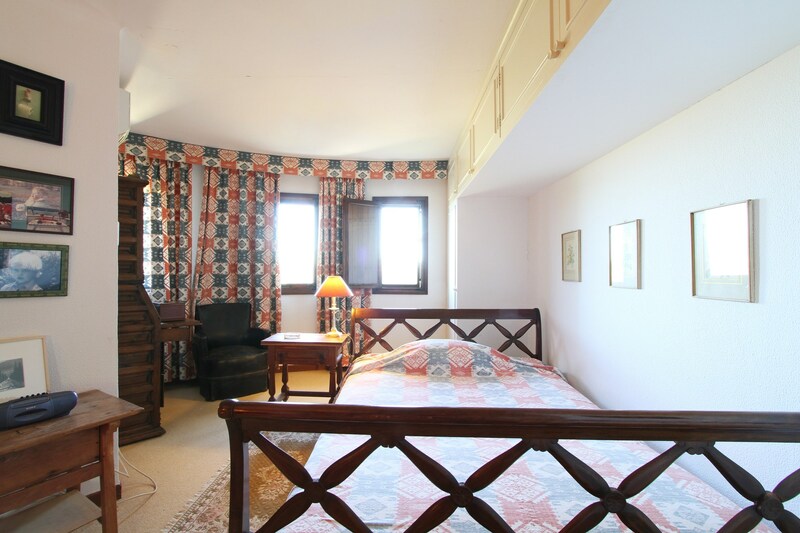 It certainly is a different experience, although it should be noted that the ‘tower’ accommodation is not suitable for young children. 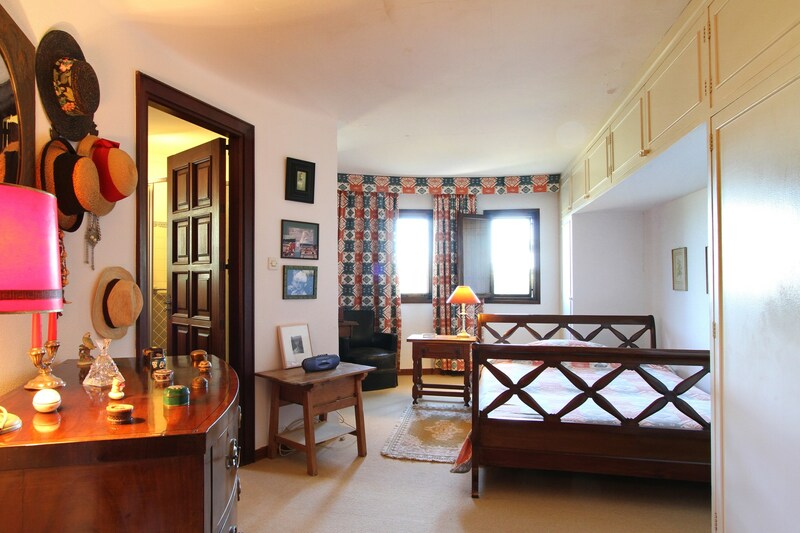 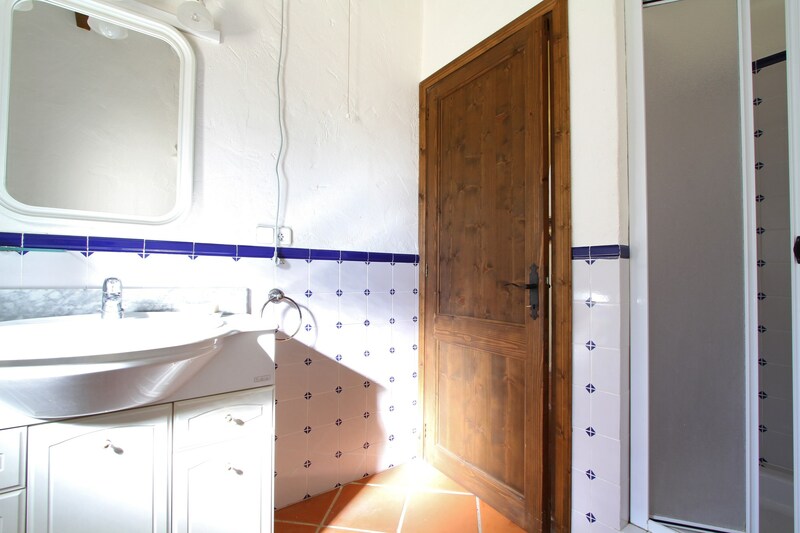 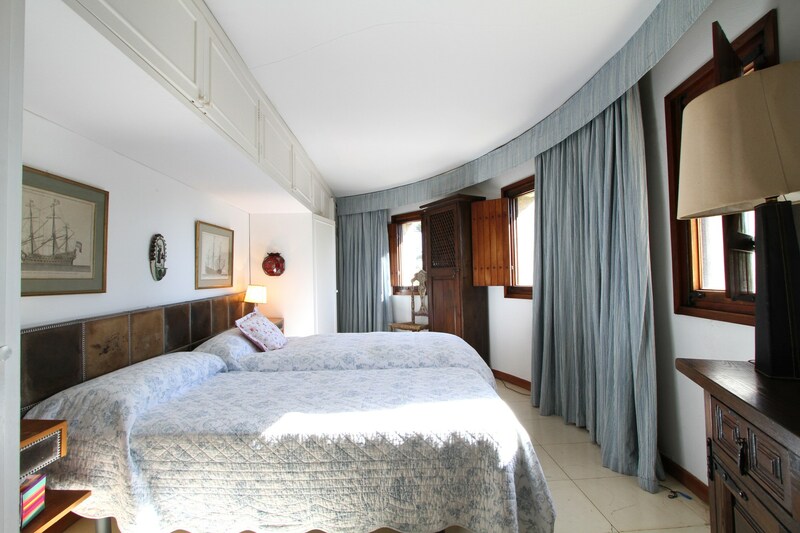 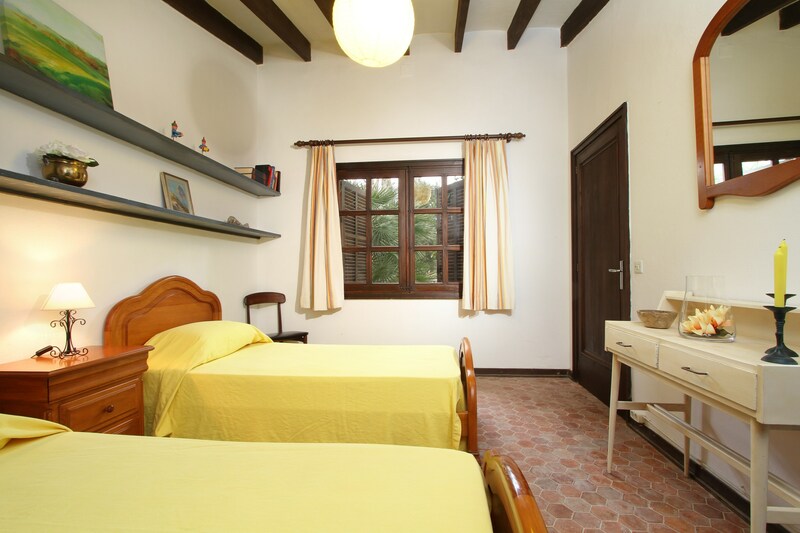 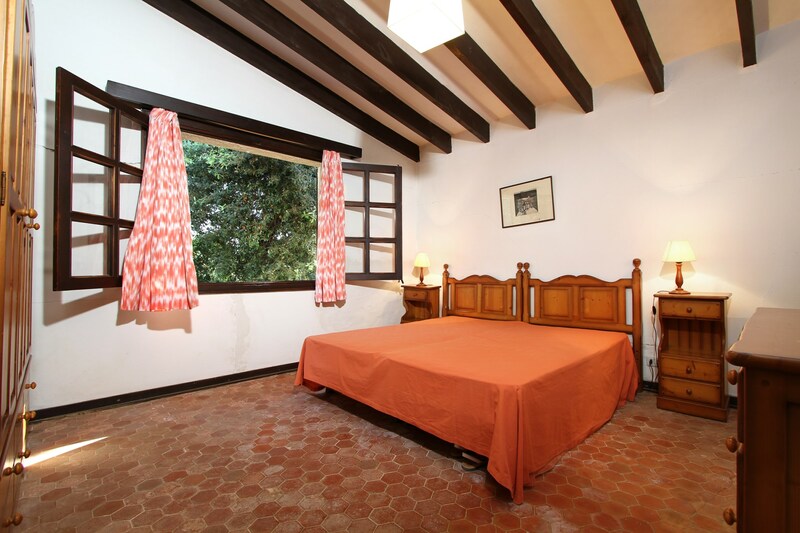 The largest of El Bikoro’s buildings is the 4-bedroom casita which features two double bedrooms, a further two twin bedrooms suitable for children, as well as a cosy kitchen/diner. 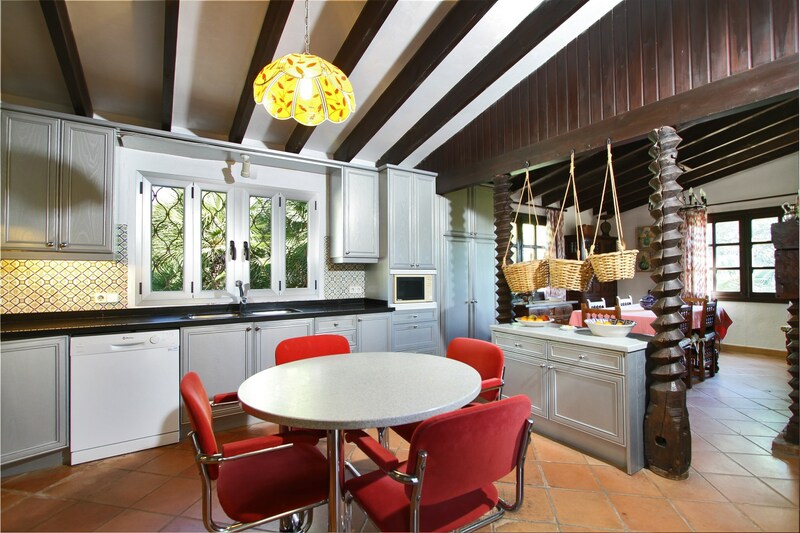 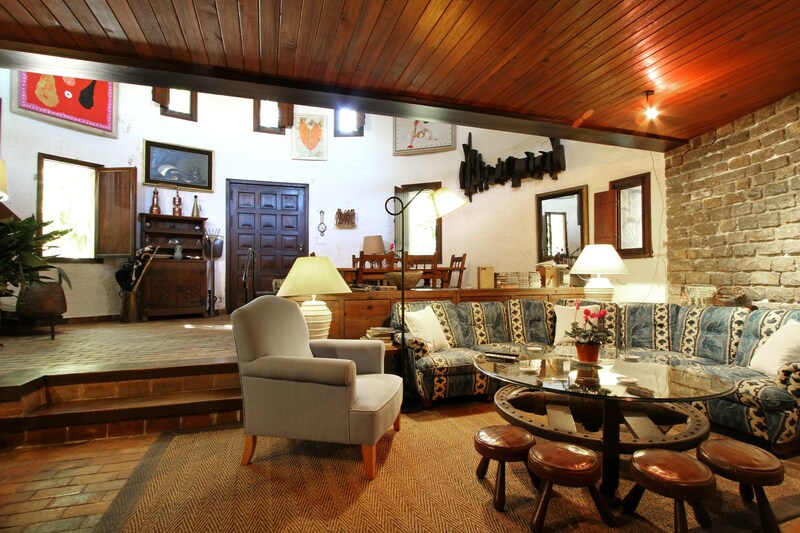 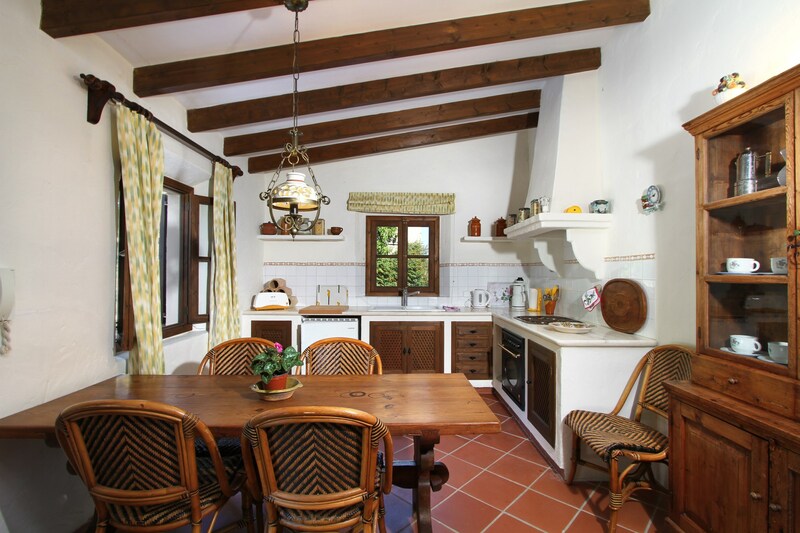 The decor throughout El Bikoro is the epitome of traditional Spain. 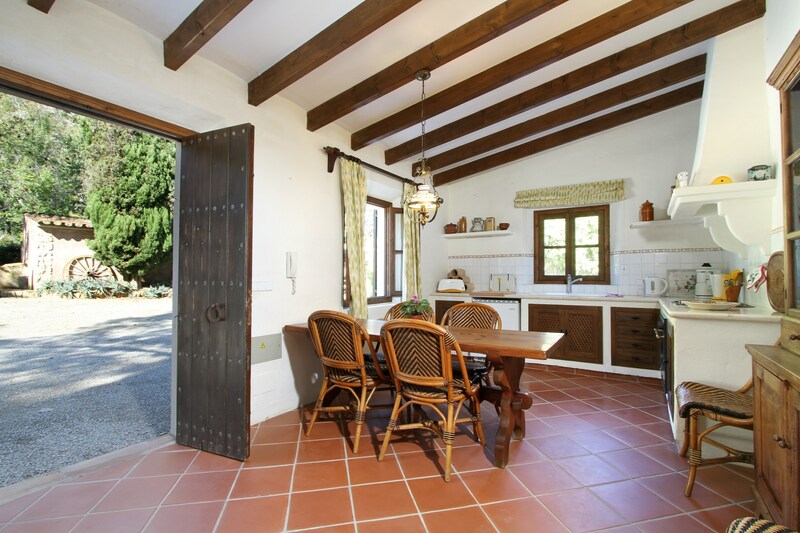 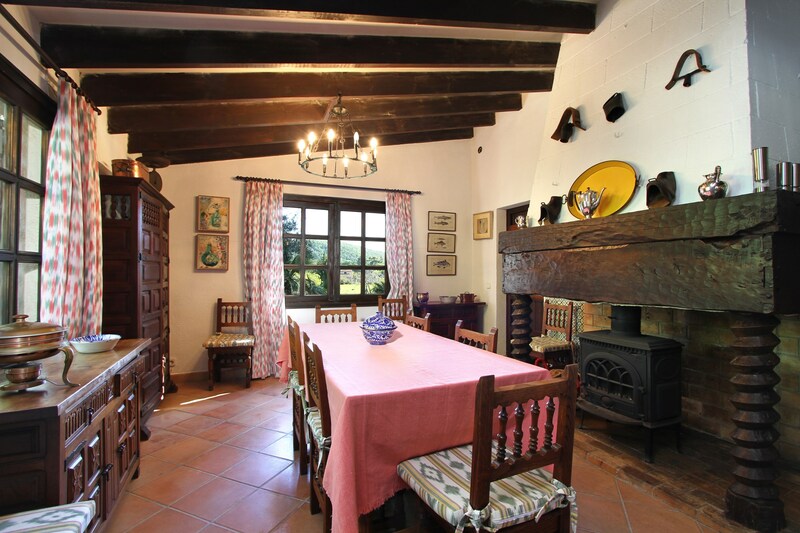 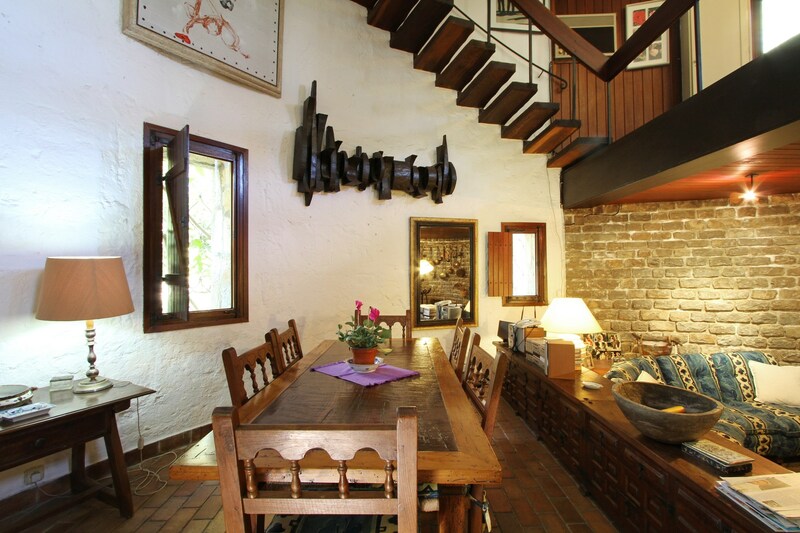 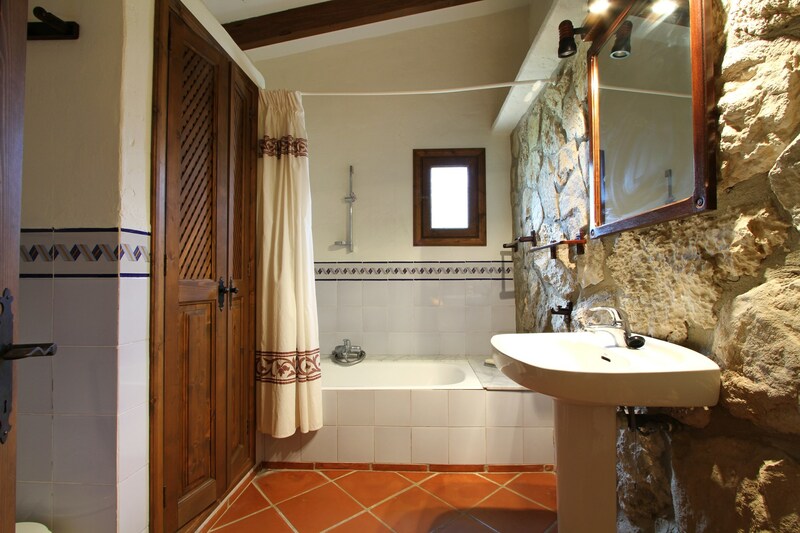 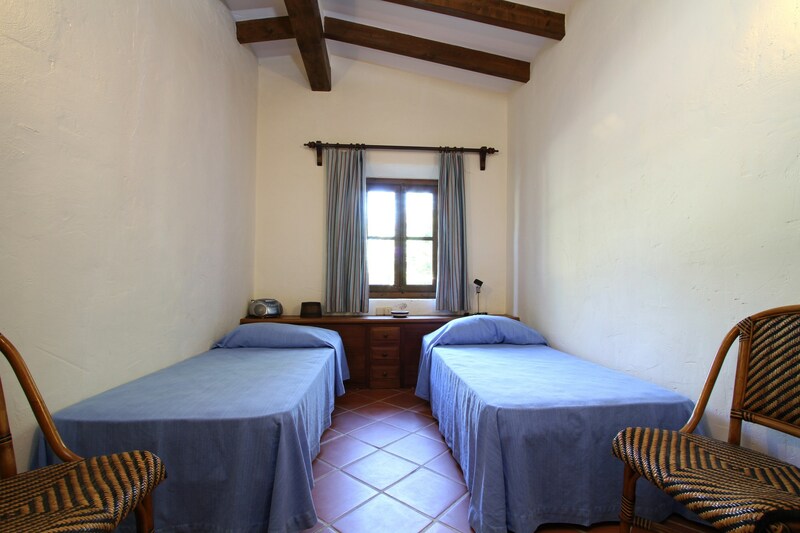 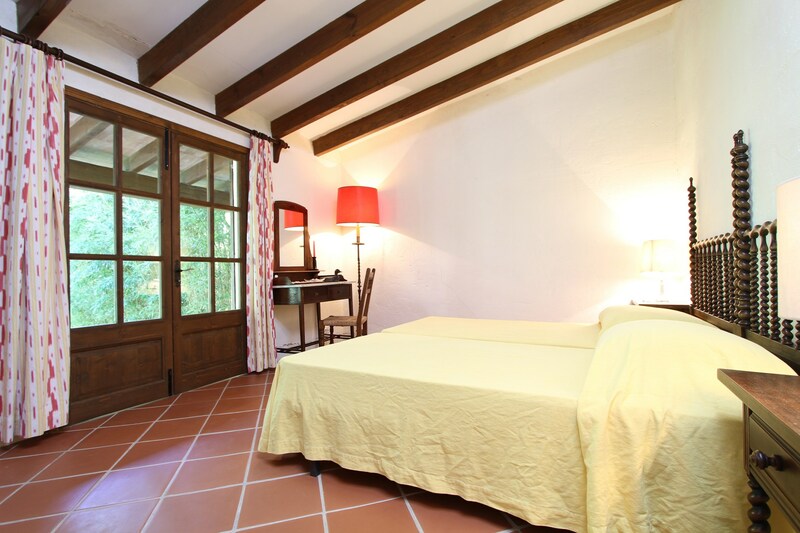 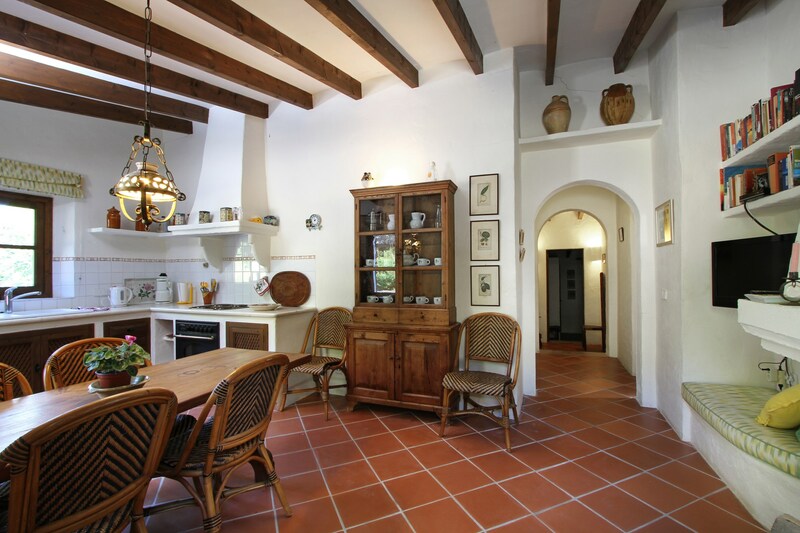 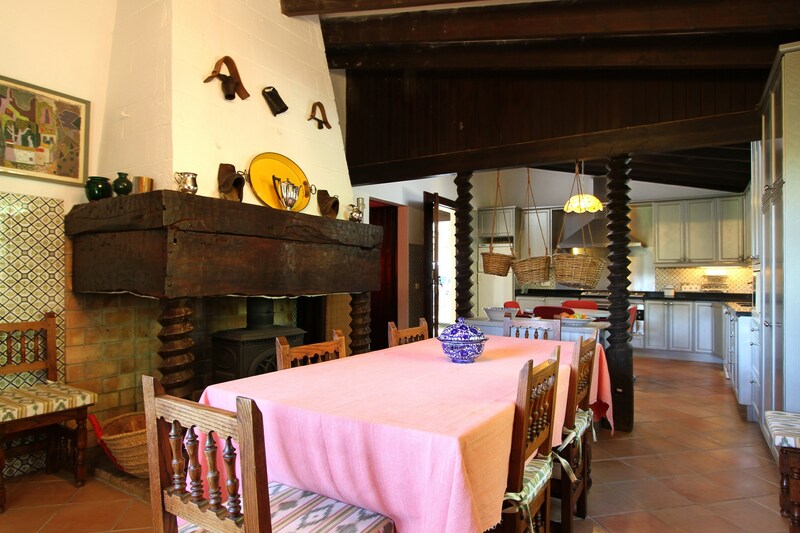 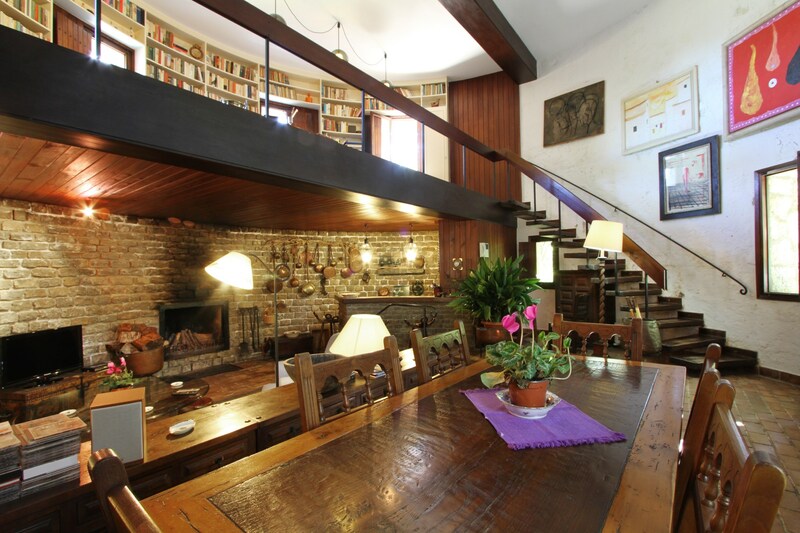 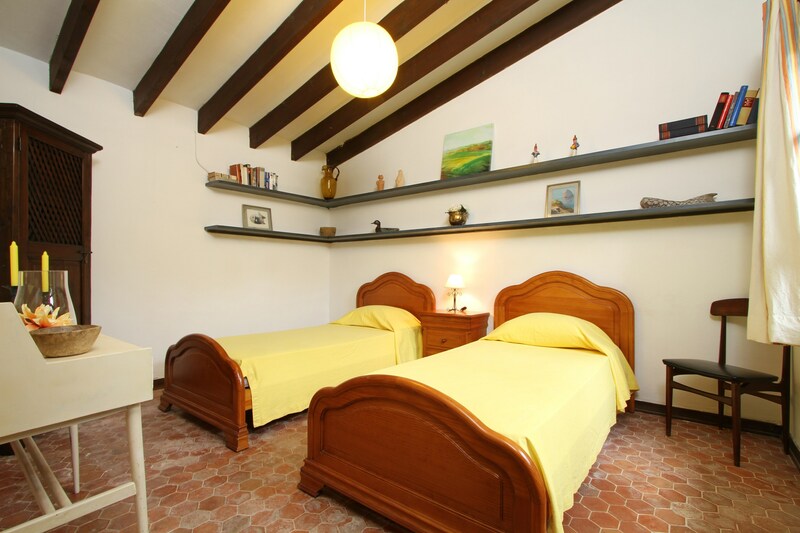 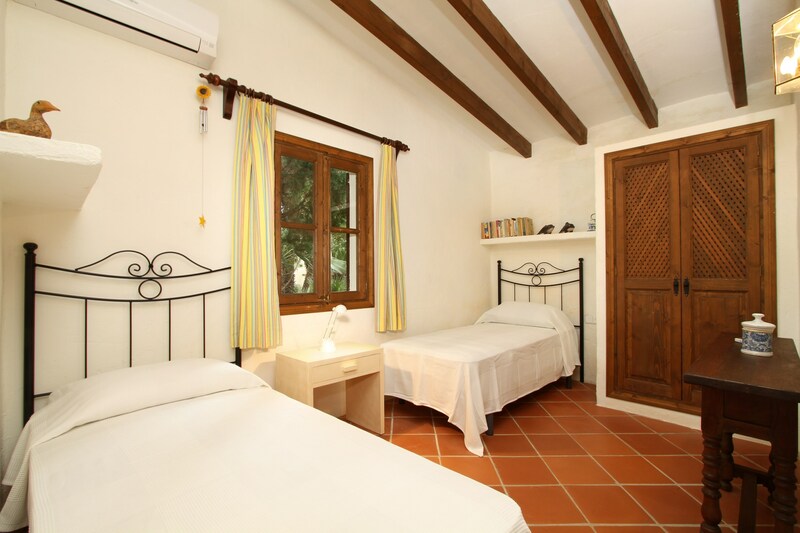 Exposed wooden beams, traditional whitewashed walls, terracotta tiled floors, old maps on the wall… just perfect for enjoying the peace and quiet away from the crowds. 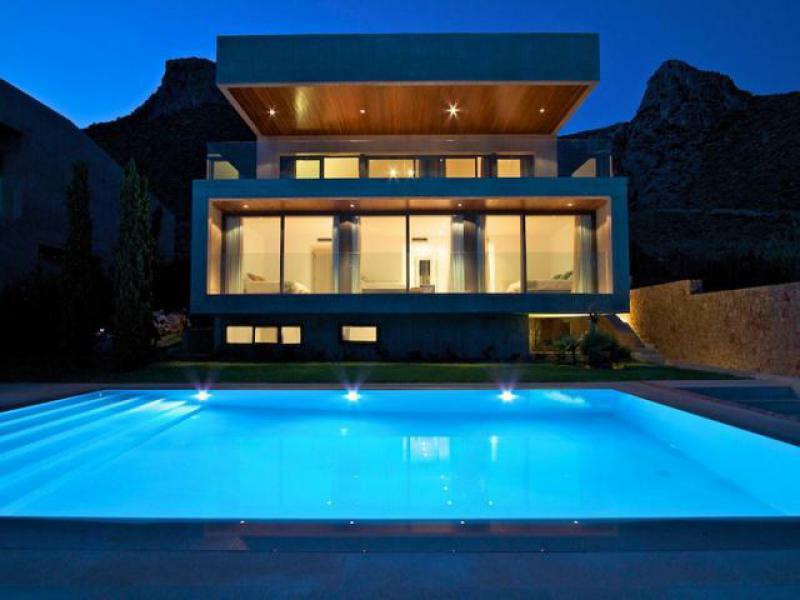 The outside of the El Bikoro private estate is no less spectacular. 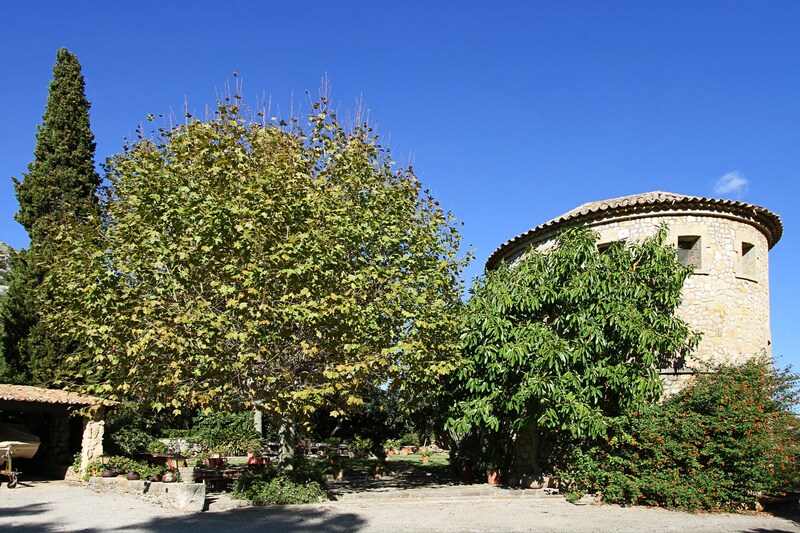 The huge gardens are lush, mature and peaceful. 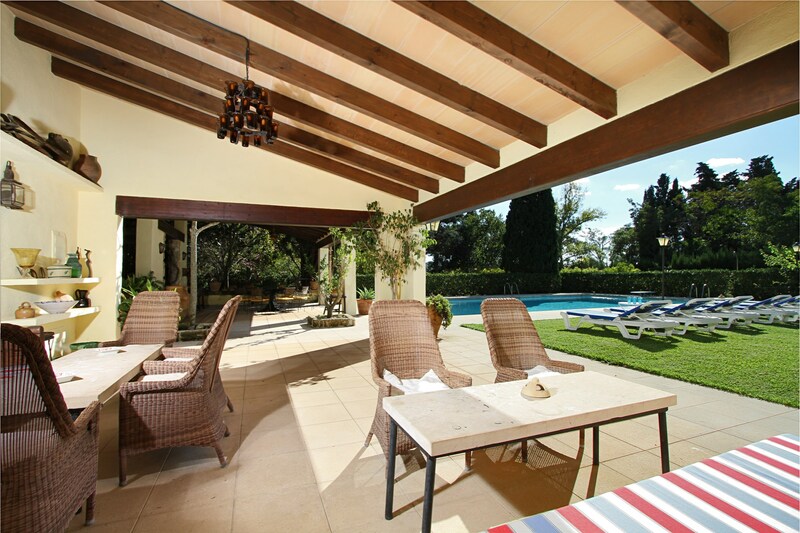 Lush green lawns, tall palm trees, leafy paths, paved walkways and gorgeous traditional terraces all combine to add a touch of magic to the place. 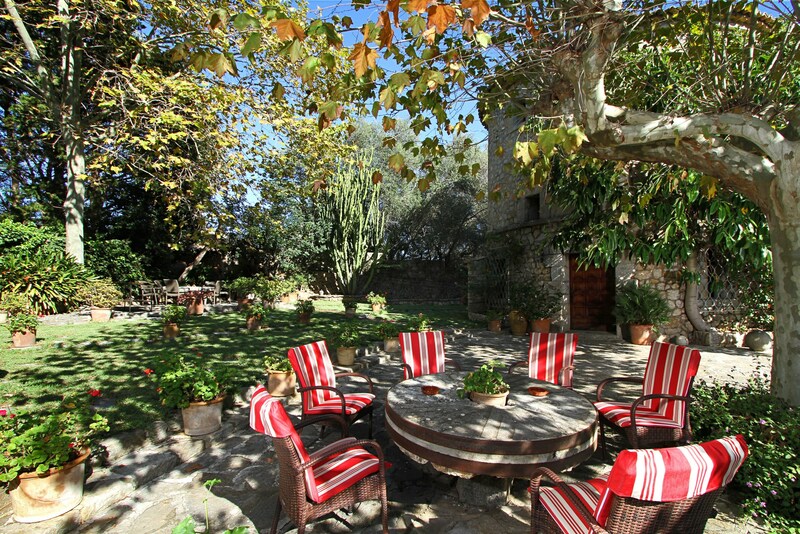 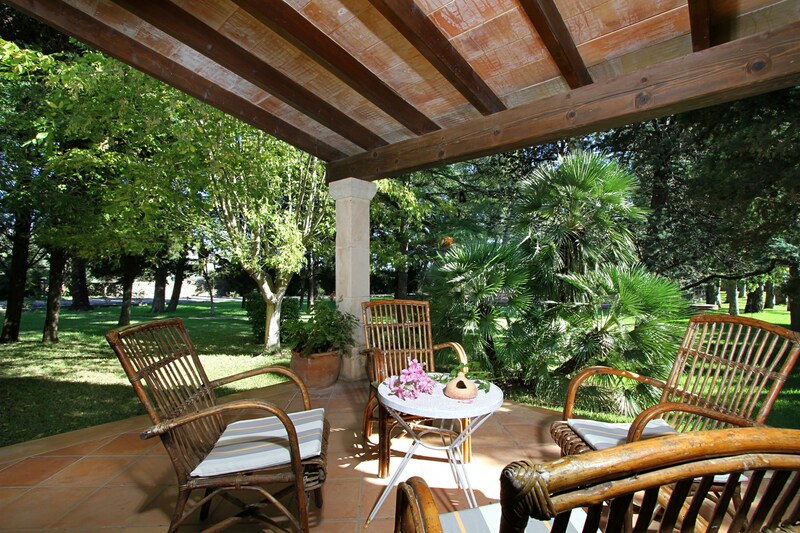 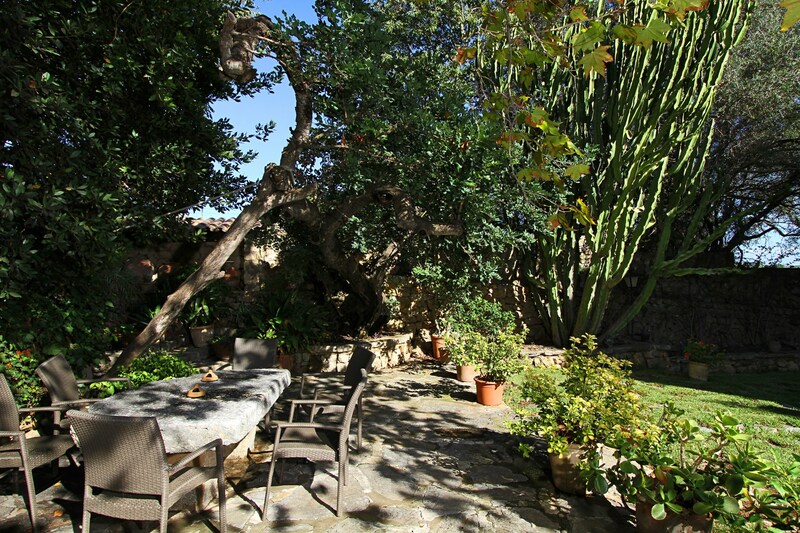 There are many seated shady areas too, if you want to escape with your thoughts into a delightful private place. 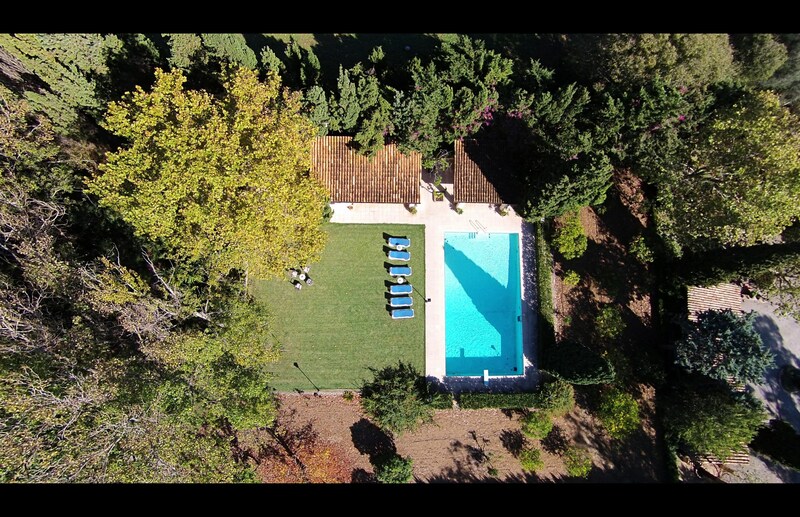 And don’t forget the swimming pool! 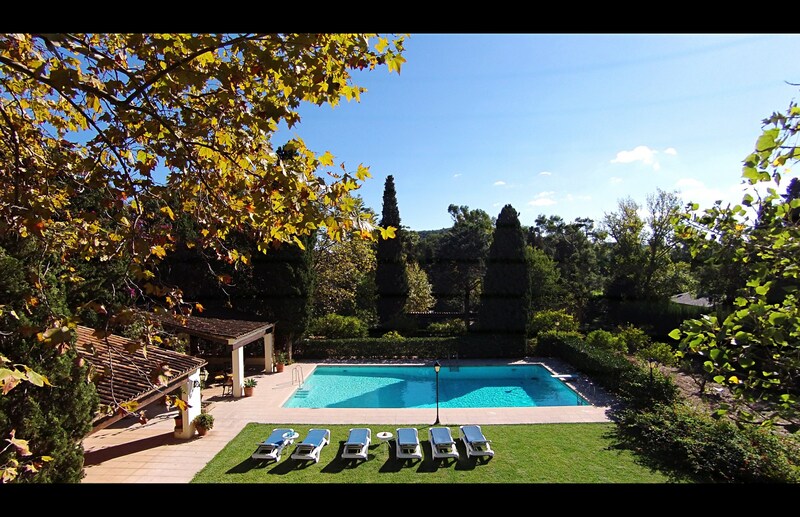 The dimensions of the pool are 8m x 15m and the depth is between 1m to 2.40m, it’s large enough for healthy exercise, and also great for cooling off during the hot summer months. 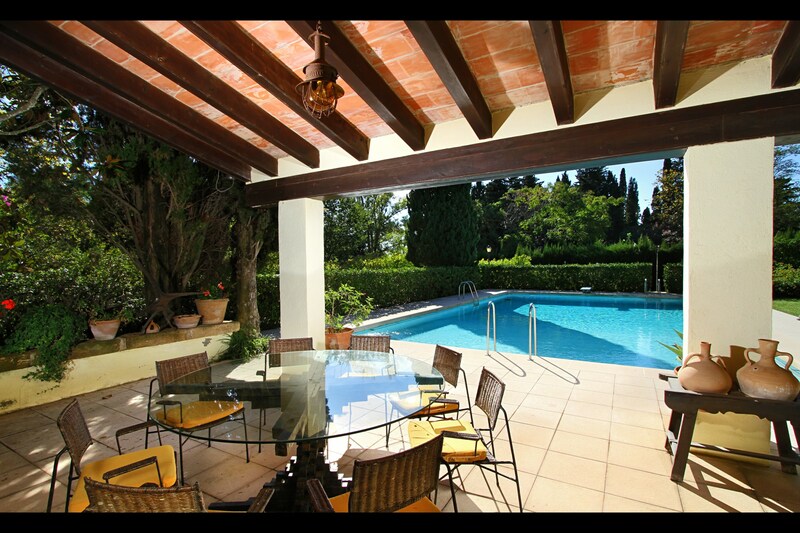 Around the pool you’ll find lots of sun loungers as well as a covered terrace complete with BBQ and dining area. 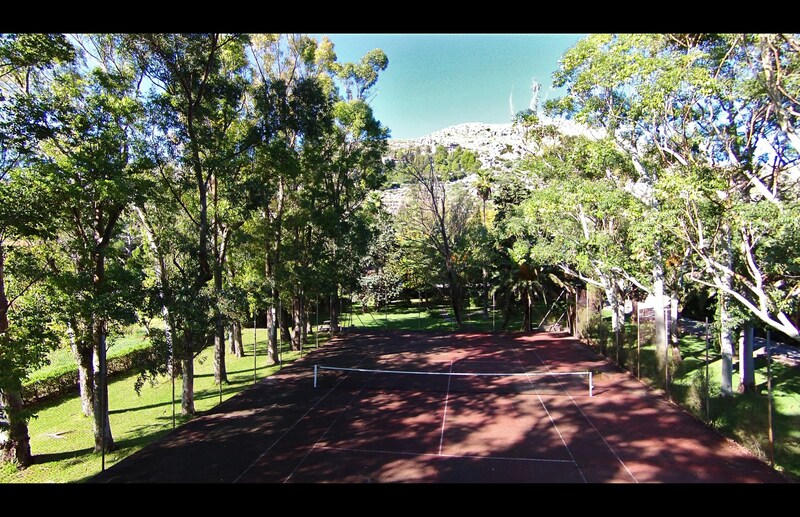 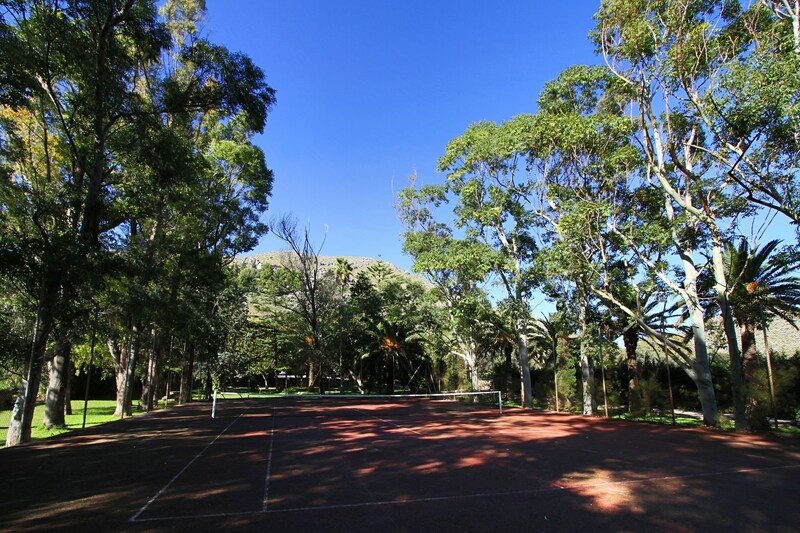 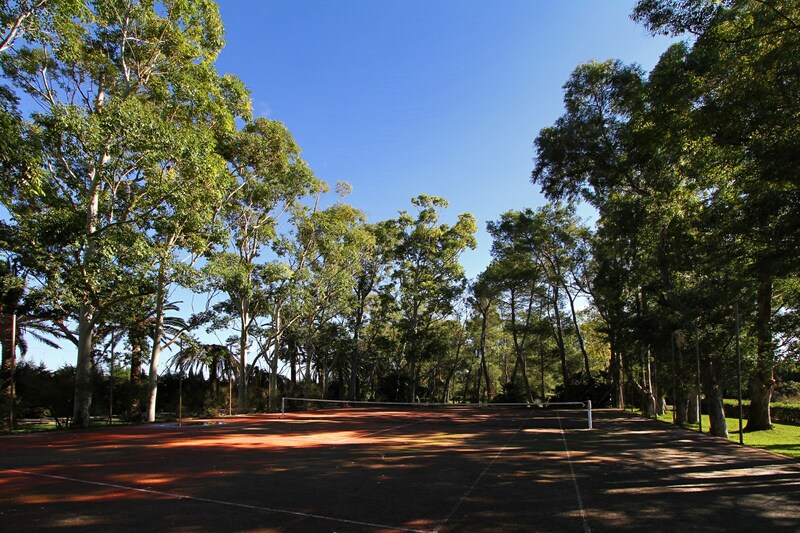 If you’re feeling active (and not a little competitive) the near professional size, tree-lined tennis court is there to challenge you. 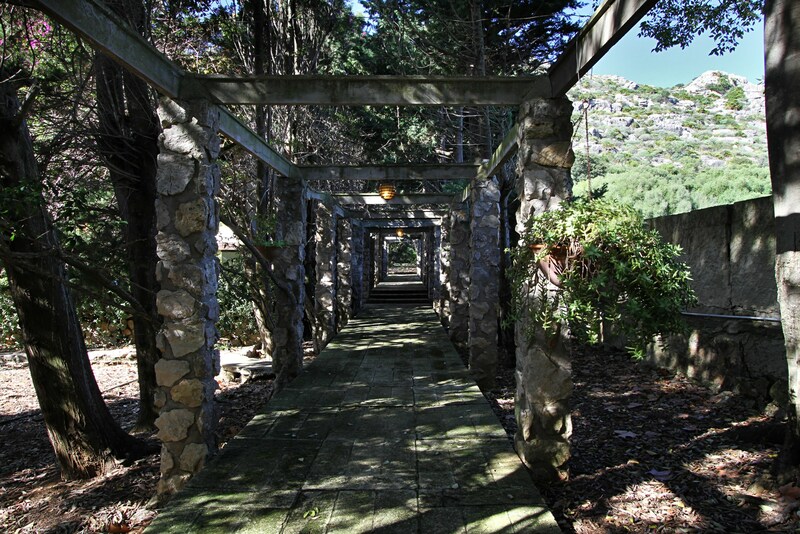 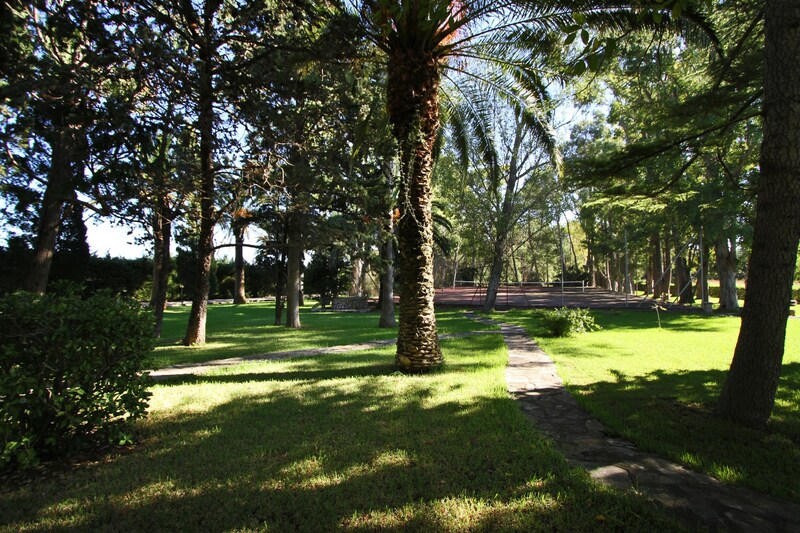 The extensive grounds of El Bikoro also feature a lovely large circular covered terrace area set in a natural forest. 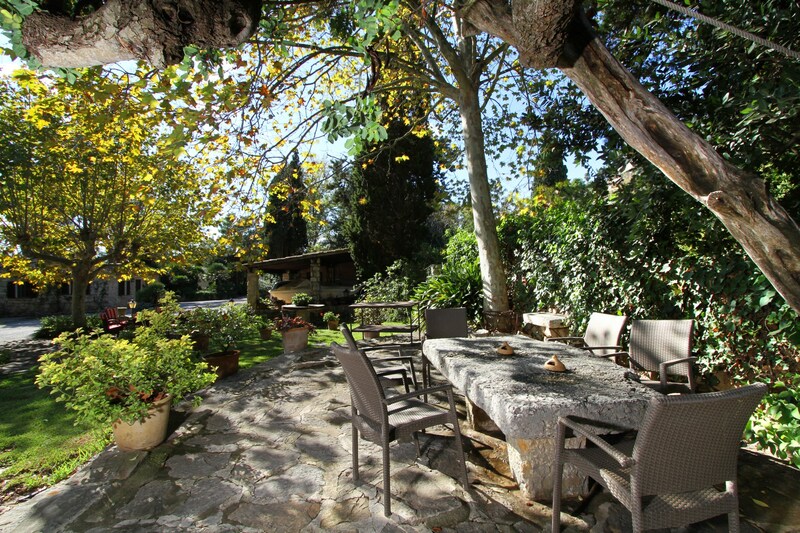 Just the ticket for an exceptional al fresco dining experience.